The work above is "View of Albany, NY From the East." It's a print, the original of which was created by the artist Edwin Whitefield in 1845. And it's part of the new exhibit at the State Museum, Art of the Erie Canal. The print caught our eye while looking through the exhibit because 1) Albany (obviously) and 2) it depicts an Albany that hadn't quite totally spread west up the hills from the river. Those hills are obscured by buildings in so many images of the city. Whitefield apparently had a thing for cities and wanted to document them for history. 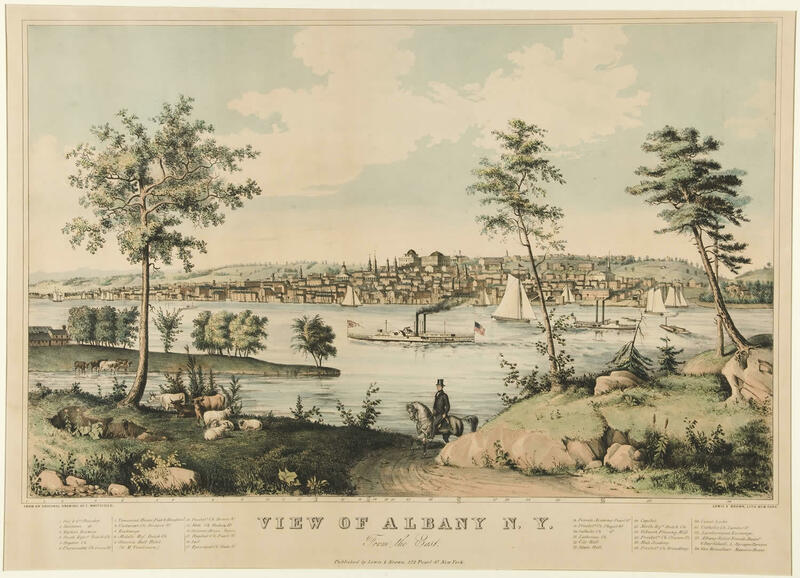 Among his other cities works is the aptly-titled "View of Troy, N.Y. From the West." The print on display in Art of the Erie Canal is from the State Museum's collection. The image above is via the Yale University Art Gallery.